I recently gave my blog a new makeover. How do you like it? I will add more and more improvements as time goes by. Today I am sharing with you a vegan recipe that completely satisfied my wild cravings for “A.” sweet potatoes, and “B.” pancakes. Which by the way, the ladder is one of my most favorite foods on the planet. Also for those of you that are unaware of a product called Red Palm Oil, it is what i used to cook the pancakes . Red Palm Oil is amazing. It’s rich in Alpha and Beta-carotene so it’s great for your peepers. This great fat is actually good for your heart as well. It can be used on salads and even organic popcorn because it tastes similar to butter. So here we go. Enjoy, and always remember to cook with your favorite music and love, as it makes the food taste better. Thank you for choosing good health! Cut sweet potatoes in cubes and boil them in water until done. Chop up onion in small fine pieces. In a large mixing bowl place the cooked sweet potatoes, chopped onion and all seasonings. Mash up and mix well. Place 3 tablespoons of Red Palm Oil in a frying pan and heat. When ready , take at least 2 to 3 scoops of the potato mixture to create a pancake in the pan. Fry till crispy on each side. 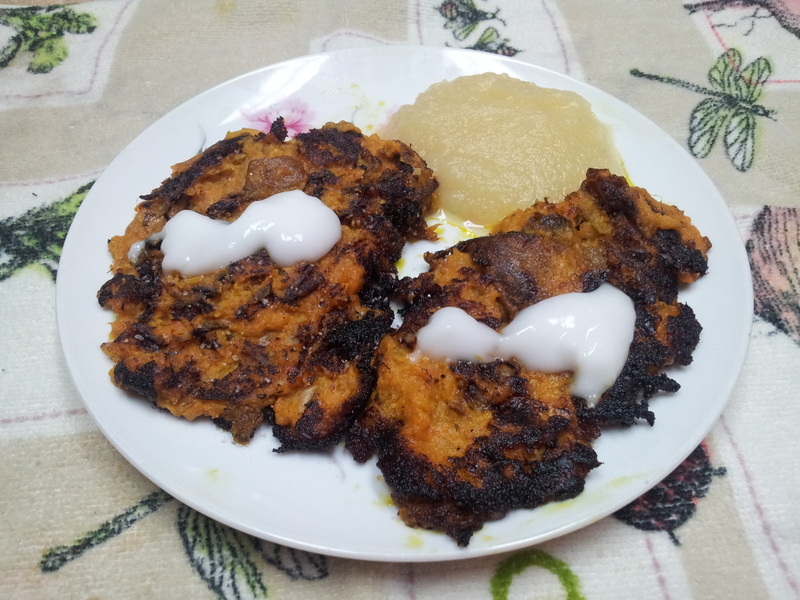 After you place your pancakes on the plate, use to spoon to drip the coconut yogurt on top of the sweet potato pancakes. Attack on sight, LOL! Just kidding.